I already know how to cook, but I was delighted to discover this gem of a food book for children, mainly because it doesn’t just teach how to make flapjacks and cupcakes. 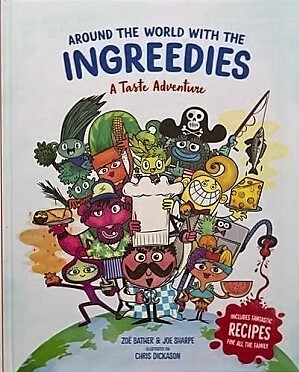 The Ingreedies takes a culinary journey through the delectable feasts on offer from countries around the world, explaining native crops, foods, customs and delicacies. The first thing that hits the reader is the bold illustrations. The book is narrated by colourful cartoon explorers called The Ingreedies. These strange looking, rather vibrant, cartoons, who are typically types of food or spices, travel the world looking for ingredients and recipes – using speech bubbles to convey their dialogue, and interspersing the bulk text with their dialogue. Many of the pages are maps of the world, with introductory paragraphs, but overlaid with the Ingreedies and the food they have found. The first stop is the Americas, showing a map of the two continents, and highlighting and explaining key ingredients, such as jerk, turkey, maple syrup, quinoa, feijoada and sugar. The book then delves deeper into a few of the countries with facts about farming, traditional foods, history and geography. In the middle of these are some family recipes, including, in this section, haddock chowder, spicy street wraps and brigadeiros. Each continent is explored in the same way. It’s a fascinating dip into food terms and ingredients, for example, teaching what Americans mean by grits, and the terms for different shaped pasta. There’s a chart showing the potency of chillies, how tarte tatin was invented by mistake (burning the pan), as well as a look at local customs including a French high street and a Thai floating market. 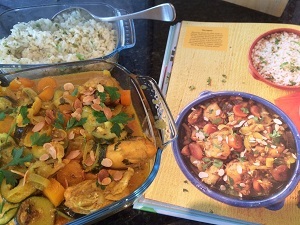 Of course, when in Rome…or rather Morocco – I tested one of the recipes – with spectacular results. Not only was it easy to make, but the entire family liked it. With illustrations as vibrant as a Thai stir fry, and as informative as it is tasty, this is a great addition to the cooking canon. It’s not a recipe book – containing just 13 recipes, but it is a brilliant informational book that inspires cooking at the same time. Age 6+ years. You can buy it here. Never one for paper engineering – I had hoped to employ an eleven year old boy to review this amazing book and science set with me. However, he was unavailable, so it was with trepidation that I extracted the flatpack pages and instructions from the box behind this book, and set to work. 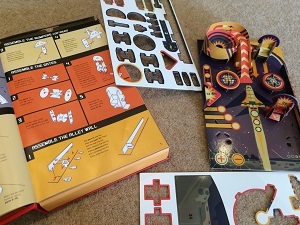 The pinball machine instructions are impeccably written and put together, with enough cardboard so that the pinball machine is not only easy to assemble, but hardy enough to play numerous times afterwards (funnily enough, the eleven year old was available to test it out – with strength – many times!) See video at the end of the page. 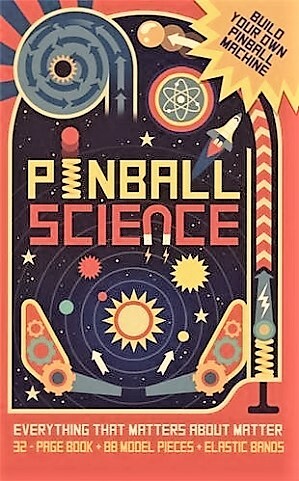 But, of course, aside from the fun in putting together this pinball machine, the accompanying book teaches the physics behind it. And of course with the practical application alongside, it all makes much more sense. Ingeniously the contents page is a picture of the completed pinball machine – with each part labelled to show the corresponding page number. For example, the flippers are explained in ‘flipping levers’ on page 18, the bumper in ‘bouncing science’ on page 24. Not only was I raring to read about the science behind it, but I felt a warming sense of achievement that I had built it exactly as shown. The science is about motion, including Newton’s three laws of motion, forces – from springs to gravity, as well as wheels, pulleys, inclines, wedges and screws – all the things I used to make my machine. Within the individual explanations there are also other little practical experiments to exemplify a point – such as using an empty bottle, rice and a chopstick to test resistance. With stunning illustrations and graphics in Owen Davey’s now very definitive style and colour scheme, this is an absolute scientific treat. For even the most unsciencey among us. This brilliantly hands-on book teaches physics with skill, aptitude and interest and is expertly executed. If every student made their own pinball machine from this book in class, we’d have a country filled with engineers. And this family now has its very own pinball machine to play with. It’s still going strong. And giving oodles of fun. (My only quibble – I wish the book could detach from the box.) Age 8+ years. You can buy it here. A while ago a parent showed me a book that her daughter, a reluctant reader, adored. It was called Wreck This Journal – one of many titles by artist Keri Smith that encourages the reader to use the book as a creative outlet – to make mistakes inside, poke holes in pages, deface it etc. 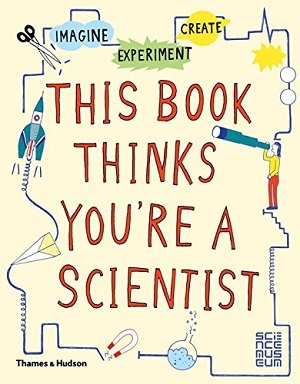 This Book Thinks You’re a Scientist is also asking the reader to respond to it – to write in it, play with it, fill it in – but this time with a very positive aspect – it is teaching science. It wants to instill the idea that you don’t need a white lab coat and a Bunsen burner to be a scientist. You just need to look around and ask questions. From taking a random object in your house and examining it (leading questions are contained in the book), to performing tests on yourself such as running, tipping yourself over and suchlike, to even experimenting on the book itself – “Invent a way to move this book as far as you can in one go.” Although it does warn about lobbing the book across the room at fellow family members! Bright and colourful, with endless pages of experiments (all easy to perform, none needing any special apparatus), to actual explanations of science: “An object that is moving has ‘momentum’. This means the object will keep going unless another force stops it, like friction or air resistance”, so for example when I hurled the book across the room (at nothing, not a family member) it stopped when it hit the wall. This book provides hours of fun entertainment, and also teaches something at the same time. Other highlights for me include the puzzle of Farmer John, the fox, the chicken and the corn, the experiment to see if chocolate and ice cream taste different frozen and warmed, and my new-found incredible ability to bend water. And while the reader is doing all these things, they are learning (almost by osmosis, but also by the simple explanations within) about force and motion, electricity and magnetism, earth and space, light, matter, sound and mathematics. Produced in association with London’s Science Museum, and with snazzy illustrations (check out the superhero) by Harriet Russell, this is a great book to learn while doing. For age 7+ years. You can buy it here.